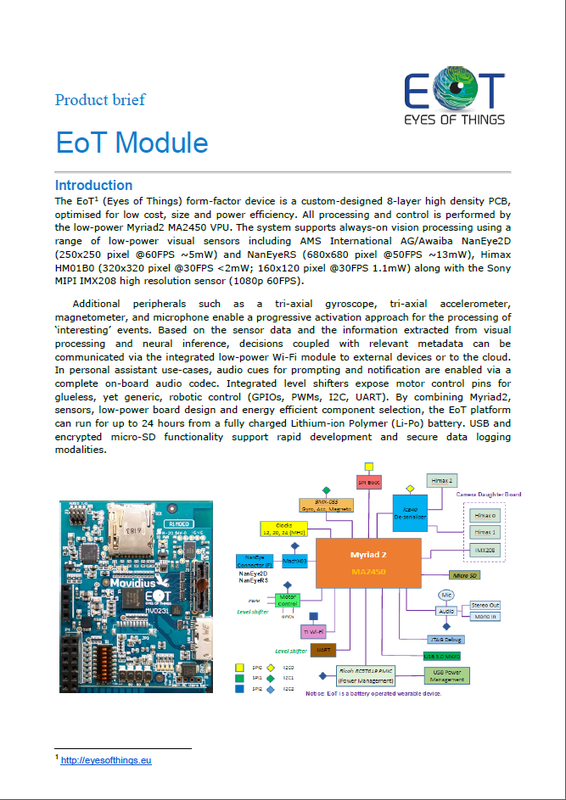 @EyesOfThings partner Movidius sends a present for Christmas, the first EoT boards! The HiPEAC conference is the premier European forum for experts in high-performance and embedded computing. EoT will participate in the PEGPUM workshop as well as in the EU Projects Poster session. Responsible Research & Innovation: EoT Ethics Board meeting in London today July 14, 2016. World-renowned experts Petra Ahrweiler, Daniel Neyland and Lorna Woods. EoT partner Movidius Named in 50 Smartest Companies 2016 by MIT Technology Review. More info. Intel has acquired computer vision and machine learning startup Itseez to develop better navigation for self-driving cars. Itseez is a key contributor to computer vision standards and libraries including OpenCV and OpenVX.